So Dainese have come out with a new set of gloves that will takes a lot of inspiration from its Moto GP sibling, the Dainese Full Metal 6 gloves. They are pretty similar in design and function pretty similar as well but the Steel’s will come in at a more reasonable price of about 260 USD RRP. 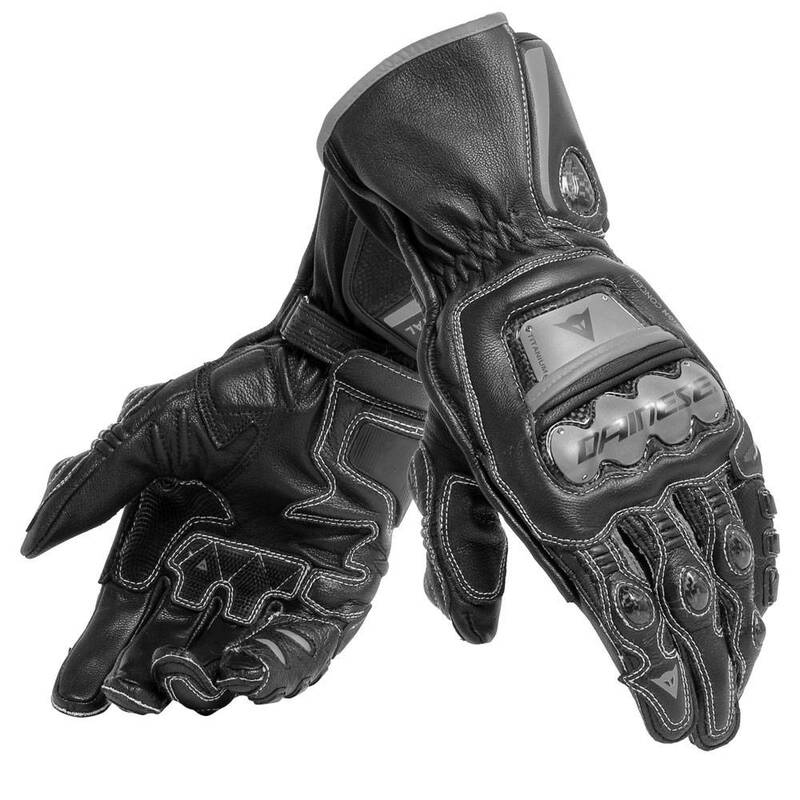 These gloves are designed for your more sporty riders and for your track goers. These are positioned pretty well for the higher speed riders out there and obviously come with appropriate protection. You also have the Dainese Steel Pro In gloves which are meant to fit inside of a sleeve and I’ll explain that later on but they are mostly the same glove. If you guys want to learn more about gear, win some champion cash and talk with me about gear make sure that you join us in our Live Store. We also have great discount codes for the gear that we show. You can catch us on Facebook every Wednesday and if you want to learn more you can go to championhelmets.com/livestore. We get a lot of safety with this glove. It has been given a CE CAT 2, Standard 1 safety rating, so it has been tested to be safe and this is largely thanks to the materials used in the gloves. Most of what you get is goat skin leather which is strong but also soft and flexible. Then we have reinforcements made out of stainless steel which offers some pretty tough abrasion resistance and strength to glove. All over the glove you can find raised areas of TPU reinforcement and that is going to be thermoplastic. So there is plenty of protective material on this glove. So now lets run through the glove. On the fingers you het areas with double layers of the goat skin leather on top and then raised bumps of TPU protectors covered in leather. These are in high impact areas on the joints of the fingers. There is also a DCP system on the little finger or distortion control protector and this system works to keep you finger bending in the correct way, so obviously a great feature. Then we get some more raised TPU on the outside of the pinky, which is a high impact area. Coming up to the knuckles and the back of the hand, we get to the heavy duty protection. In these areas there are plates of steel, with the plate over the knuckles having been formed into the shape of the knuckles. Underneath these steel plates there are also areas of thermoplastic to provide more protection to the area. There is a semi-flexible thermoplastic plate around the side of the hand as well for protection on that vulnerable side. Onto the palm now and you get more of the goat skin and it has double layers in a few areas of the palm. This will help you glove last longer over time but also give some abrasion resistance, particularly between your pointer and thumb. There is a raised section under the thumb, close to your wrist for abrasion and impacts resistance and then the cool part is the micro injected reinforcement that will help you grip better with your palm. The cuff is the only difference between the Pro and the Pro In gloves and that’s because on the Pro gloves that it has a thicker cuff, over top of a soft and flexible material. On the pro In gloves, you only get that soft material, which is also breathable and it is elasticated to give it a tighter fit on your wrist. Basically, the Pro In is designed to fit into jackets which are prepared for it and seal like that. Both gloves come with TPU reinforcement covered in leather on your wrist as well. For comfort, the glove is made out of goat skin and from that skin we get lots of flexibility. Remember as well that this is meant to stretch out about half a size. So you should get gloves that feel a little tight and then expect them to loosen out a little over time. We also have elastic and accordion-like material for extra flexibility. The glove is preformed as well so that means that it will naturally fall into this kind of loose grip and this is comfortable while riding because then you don’t need to fight the glove while gripping. For ventilation, these are pretty warm gloves though they do have small openings on the inside of the fingers. Having trouble telling which glove is which? The gloves on the left are the Dainese Full Metal 6's. The Dainese Steel Pro and Full Metal 6’s are pretty similar except for 2 really key differences. The Full Metal 6 is made out of titanium on the knuckles and back of the hand, while the Steel Pro’s are made out of steel. Then the raised protectors on the fingers and wrist are made out of carbon fiber which is stronger and lighter than TPU. So these are the main differences between the gloves and it really comes down to those materials. The Full metal 6 gloves come in at 420 USD RRP though and that makes the Steel Pro gloves much more affordable at 160 USD less. 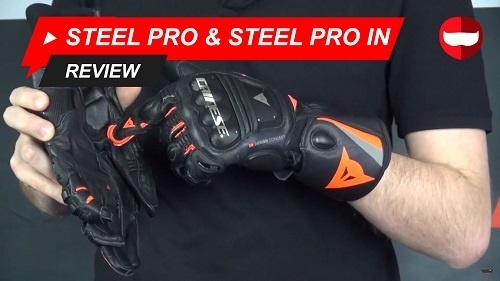 I hope that you guys have found our review of the Dainese Steel Pro gloves useful because these are very strong sports and track day gloves that offer plenty of protection and some pretty decent comfort as well. If you want to learn more about anything Dainese, gloves or motorcycle gear related, make sure that you subscribe to us on YouTube and we can keep you up to date. Thanks for reading!